Double glazed sash windows are a very important part of the modern home for both insulation and comfort, it can be a mine field however if you live in a conservation area. With many sash window companies providing factory run standard windows that will not meet the conservation officers approval it could be a very expensive mistake to make as you could be forced into doing the whole job over to meet the required standards. Mortice & Green specialize in making bespoke reproduction windows that perfectly replicate all the period features of your home and they are double glazed using extremely discrete slimline double glazed units with colour coded spacers to ensure the window appears from the street to be single glazed. All our bespoke windows feature colour coded thermal super spacers to ensure that the window looks like the single glazed original window it replaces. 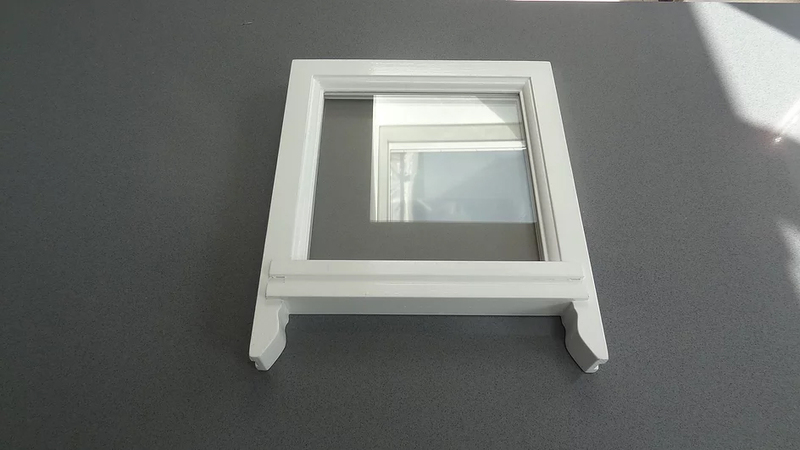 As part of the fitting we also provide a draught proofing system to ensure that the double glazed sash windows perform to the highest possible standard and provide excellent thermal protection and noise pollution prevention. If you are interested in replacing your existing sash windows or wooden casement windows then why not drop us a line? We would really like to hear from you and offer free advice and quotations throughout London. All our windows are manufactured entirely from European Oak and hand finished in our workshop to perfectly replicate your original windows. We have been manufacturing windows for over twenty years and have expert experience of working with clients living in conservation areas and indeed listed buildings. Double glazing is believed to have originated from Scotland in Victorian times. Due to the harsh UK weather, homeowners mostly relied on a fireplace to keep warm. As the Victorian houses have high ceilings and more rooms, they tend to be colder. This is when double glazed windows were invented by the Scots. Here is further information about the history of these replacement windows as well as their benefits. During the 1930s, a US inventor called Haven created the innovative Thermopane which rose to popularity in the UK and USA. Prior to this time, most building regulations were somewhat relaxed as homeowners did not have the incentive to improve the energy efficiency of their properties. In addition, double glazing materials were expensive until the aluminum frame was introduced. As a result, the cost of double glazing began to fall and many homeowners decided to use it. As the years passed, the number of double glazing manufacturers rapidly grew to meet the high demand. These types of windows now come in a variety of frame materials and glass, from UPVC to wood. Today, Fenestration Self Assessment offers incentives to double glazing contractors in order to avoid scams. This means homeowners will get a certificate with a 5 to 10 year guarantee. Now that there are lots of energy efficient products available for homeowners, tackling insulation and noise has become easier. But there are plenty more advantages in installing double glazed windows. Here are some of them explained in detail. When you opt for double glazing, your family will feel more comfortable in your home. This type of window will help keep the heat out in the hot summer months whilst keeping the warmth in during cold winter months. This in turn will save you money on energy bills. The reason double glazing is able to reduce heat loss in buildings is due to its insulation. The material it is made from captures and stores a higher percentage of heat from the sun. In addition, homeowners can enjoy cooler summers as the insulation material in the window protect them against high temperatures. This is unlike single glazing that is not able to effectively repel heat. In fact, if you have single glazed windows, you will know how hot they get during the high temperatures of summer. Because there is less need to use your cooling system in summer, you will reduce your energy consumption and end up saving money on electricity bills. This is one of the biggest benefits to double glazing, especially if you opt to install them all over your home for minimal heat loss. It will certainly be easier to keep your home warm in winter or cool in summer, without resorting to using HVAC units. Some window manufacturers also give the option of providing more than two layers for additional protection. Although this will cost you more, it will be a better investment for the long term. What is more, many homes suffer from high condensation that can lead to mold and fungi growth. This is a serious issue, particularly in older properties or those with rotten timber frames. To protect your health, it pays to install UPVC double glazing in order to reduce excess moisture on window panes. Another beneficial factor about this type of glazing is that it minimizes noise and makes your home a quieter place to live in. High performance glazing reduces sound by up to 70 percent. Therefore, if you live on a busy road or close to the airport, you will highly benefit from this type of window. Most people are not aware of how much they can enhance the resale value of their homes by opting for double glazing. Even if your home is old, it can still be just as desirable to potential buyers if they see that it is adequately insulated. In fact, no matter how old or new your property is, you and prospective buyers will get the benefits of retrofit glazing. Interior fading that is caused by the effects of UV light will be significantly reduced. Curtains, carpet, and furniture will not fade as the glass combinations reduce the UV radiation transmission. This minimizes the need for thermal curtains or shutters that block the exterior view. Last but not least, there are also security advantages that come with the doubled glazing technology. It is more difficult for burglars to break into your property, particularly if you have opted for toughened glass. These are just some of the many benefits of double glazed windows that homeowners should know about.